A ship flying the Bahamas flag, loaded with pipes for the South Stream gas pipeline, was stuck on Saturday (3 January) in shallow water, maneuvering in the Bulgarian port of Burgas, reports Dnevnik, the EURACTIV partner in Bulgaria. 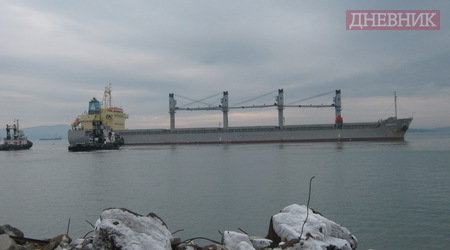 The director of Burgas’ port administration was quoted as saying that there had been no injuries in the incident, and that there was no threats to the safety of the crew, or the ship, which would be towed out to sea. It is unclear why pipes keep arriving in Bulgaria, although the South Stream project has been halted, says Dnevnik. On a visit to Turkey on 1 December, Russian President Vladimir Putin said South Stream was over, and that the 63 billion cubic metres per year (bcm/y) of gas would be shipped to Turkey instead of Bulgaria, which according to the Russian leader, had blocked the project. On 9 December, Gazprom confirmed that the decision to abandon the project is final. According to Dnevnik, this is the third arrival of the same ship in Bulgaria carrying pipes for the South Stream pipeline. Forty days ago, the same ship transported a second consignment of pipes. Dnevnik quotes the Russian agency TASS as saying that the pipes destined for the offshore section of the future pipeline are being temporarily stocked in Burgas and Varna. South Stream is a Russian sponsored natural gas pipeline project. As initially planned, the pipeline would run under the Black Sea to Bulgaria, and continue through Serbia with two branches to Bosnia and Herzegovina and to Croatia. From Serbia the pipelines crosses Hungary and Slovenia before reaching Italy. Its planned capacity is 63 billion cubic metres per year (bcm/y). The Commission has put pressure on Bulgaria to freeze South Stream, citing breaches to EU law in the intergovernmental agreement for the construction of the pipeline.